How many people see my posts? The reality of visibility online. 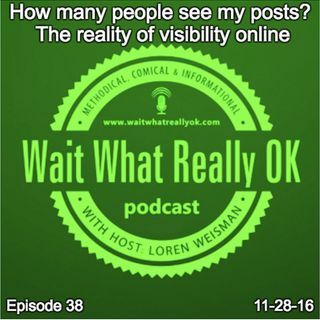 Wait What Really OK Podcast Episode 38 hosted by Brand Precision Marketing Strategist and Counselor, Loren Weisman, delivers an overview on your online and social media views. Thinking about the question itself and resetting your mind to creating the posts that the most people would want to engage with is a better place to start from. As you think more toward creating a plan around the content that you create to ... Más informaciones invite, communicate and connect with your three audiences, you build a better way to draw people in. How many people see my posts? The reality of visibility online. Ep38 of the Wait What Really OK Podcast is available on iHeartRadio or on Spreaker. Podcast Blog Supplement for Episode 38 of the Wait What Really OK Podcast with Loren Weisman. Podcast Link Supplement for Episode 38 of the Wait What Really OK Podcast with Loren Weisman. Trade Show and Trade Expo Tips. Creating results from creativity. Podcast Video Supplement for Episode 38 of the Wait What Really OK Podcast with Loren Weisman. Podcast Photo Supplement for Episode 38 of the Wait What Really OK Podcast with Loren Weisman.